There is no better way to start a new year than with New York Times bestselling author Chris Bohjalian! We are so excited to welcome Chris for the paperback release of his latest, THE FLIGHT ATTENDANT, a powerful story about the ways an entire life can change in one night. A flight attendant wakes up in the wrong hotel, in the wrong bed, with a dead man — and no idea what happened. The Flight Attendant unveils a spellbinding story of memory, of the giddy pleasures of alcohol and the devastating consequences of addiction and of murder far from home. Chris will discuss his book and answer questions, followed by a book signing. Cassandra Bowden is no stranger to hungover mornings. She’s a binge drinker, her job with the airline making it easy to find adventure, and the occasional blackouts seem to be inevitable. She lives with them, and the accompanying self-loathing. When she awakes in a Dubai hotel room, she tries to piece the previous night back together, counting the minutes until she has to catch her crew shuttle to the airport. She quietly slides out of bed, careful not to aggravate her already pounding head, and looks at the man she spent the night with. She sees his dark hair. His utter stillness. And blood, a slick, still wet pool on the crisp white sheets. Afraid to call the police - she’s a single woman alone in a hotel room far from home - Cassie begins to lie. She lies as she joins the other flight attendants and pilots in the van. She lies on the way to Paris as she works the first class cabin. She lies to the FBI agents in New York who meet her at the gate. Soon it’s too late to come clean-or face the truth about what really happened back in Dubai. Could she have killed him? If not, who did? 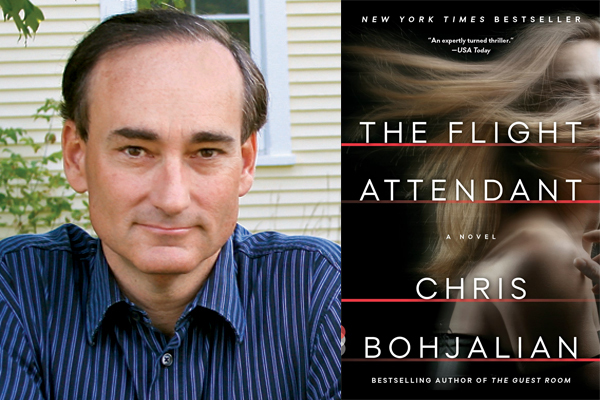 Chris Bohjalian is the author of twenty books, including The Guest Room; Close Your Eyes, Hold Hands; The Sandcastle Girls; Skeletons at the Feast; The Double Bind; and Midwives,which was a number one New York Times bestseller and a selection of Oprah’s Book Club. The novels Secrets of Eden, Midwives, and Past the Bleachers have all been made into movies and Chris’s work has been translated into more than thirty languages. Chris lives in Vermont and can be found at www.chrisbohjalian.com or on Facebook, Instagram, Twitter, Litsy, and Goodreads.